The third law of thermodynamics states (in effect) that “entropy in the universe is always increasing”. Entropy is the degree of randomness in any system. It’s a concept in favor of simplicity. Everything in the universe is moving from complex to simple situations. For example, within a star, Hydrogen atoms collide to form Helium in a process called nuclear fusion and gives off energy. Helium is a more stable atom than Hydrogen, hence this situation is considered as one moving towards greater entropy. This is the law of the universe. Yet, on Earth, we see something that is in direct contrast to this law. It is an accepted fact in ecological circles that greater diversity in nature leads to greater stability. It’s the reason scientists everywhere are so concerned about extinction of species. Loss of biodiversity is a cause of concern because as this diversity decreases, that chances of ecological failure drastically increases. One the one hand, the third law states that everything moves towards greater entropy, more simplicity. That’s the stable situation. On the other hand, ecologically, simplicity is a big problem. We need more diversity and complexity to survive. Why does this paradox exist? This was a question that was dealt with in great detail by scientists in the 1960s and 70s. There were a few scientists clearly in favor of what is visible in nature; greater complexity leads to more stability. This claim was not ill founded. The reason greater stability is found in complex ecosystems is that with more complex interactions, the ability of organisms to deal with disturbances increases. Let’s take an example. 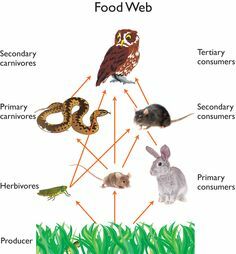 The above picture is an example of a common food web. A food web depicts various ways in which organisms eat other organisms and obtain energy for their survival. Let us assume that simplicity is a better option in this case. Let’s do something about it. I will remove two organisms from this food web, the grasshopper and the mouse. My action here can be termed as a “disturbance“. Once I do this, the number of organisms decrease, and the entropy of this system increases. Does that mean this ecosystem is stable? No. Now that I have taken out the grasshopper and mouse, the other organisms that feed on these are facing a crisis. How will they meet their energy needs? The rat, which feeds on both the grasshopper and the mouse, will have only the rabbit to eat. The snake, meanwhile has nothing to eat because it only feeds on mice! Since the snake and the rat are facing a shortage of food, they will compete for the rabbit, and rapidly decline the rapid population. Once their food decreases, they start to die. The owl, which was until now relying on only the snake and the rat (since the grasshopper and mouse was already gone), also dies as the snake and the rat disappears. The ecosystem will collapse. This has been termed the “Insurance Hypothesis“. It says that more diverse communities can express a greater range of responses to environmental disturbances. That’s how they maintain their stability. But a mathematician called Robert May decided, he doesn’t believe this to be true. The very basis of Insurance Hypothesis is against a law of thermodynamics! How can that be? Being a mathematician, he decided to disprove the hypothesis using maths. He ran multiple simulations on a computer software to determine if in fact, greater complexity meant greater stability. Guess what? He disproved it! Mathematically, he was able to arrive at the conclusion that even in nature, like the universe, the law of entropy holds good. Greater complexity is unstable. So what’s the catch? Why does nature behave directly opposite to what maths and physics predict? The answer is quite simple. What May didn’t factor into his calculations was the conditional nature of an ecosystem. A mathematical simulation would not know what the food chain is, what the trophic levels are. It would not know that plants, which are producers, can be eaten only by herbivores and not carnivores. Likewise, carnivores, the top predators, cannot be eaten by herbivores. In the universe, such conditions do not exist. In the example of the Sun above, any two hydrogen atoms, given the right conditions will fuse to give helium. There is no condition that says that only particular hydrogen atoms with specific properties can combine. That is the difference between nature and the universe. After his study, May concluded that even though his results stated that complexity leads to instability, he recognized that this is not true in nature because there is a certain way in which things work in the ecosystem. Natural ecosystems are “a special part of the universe”, where greater complexity leads to stability. This just reinforces how unique Earth is.